When you visit the park at Grandfather Mountain NC you can check out the numerous nature habitats and view animals such as black bears, golden eagles, white-tailed deer, cougars, and river otters. Also, atop the mountain is the famous Mile High Swinging Bridge, Grandfather Mountain which leads those brave enough to cross it over cable bridge that connects two huge parts of the mountain. On a clear day one can see up to a 100 miles away from atop Grandfather NC. You can even view the skyline of Charlotte, North Carolina from here. Crossing the Mile High Swinging Bridge is always a milestone for those that find themselves in the NC Mountains. 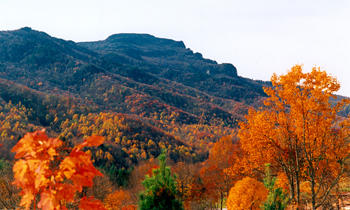 In addition to the trails at Grandfather Mountain State Park which traverse all over the mountain, Grandfather also features a historical museum devoted to paying homage to the people that inhabited the mountain during the time before settlers appeared here. Native America artifacts and other relics are displayed as well as examples of early settler life. There&#39;s even a restaurant on the mountain,&nbsp; Mildred&#39;s Grill at the Nature Museum seating 140.&nbsp; You can also dine outside at any one of the 100 picnic tables throughout the park. After dining at the restaurant you can pay a visit to the Grandfather Mountain Fudge Shop to satisfy that sweet tooth. Annually, the mountain hosts one of the North America&#39;s largest gathering of Scottish Clans, the Highland Games Grandfather Mountain NC. The Scottish games showcase the best of Scottish ancestor and celebrate all things Celtic and Gaelic. Ashe County is just a short drive away and would make for fun and exciting day trip. Ashe County is also remarkable place to live or relocate to. When you own Blue Ridge Mountain Real Estate in Ashe County North Carolina, you will enjoy having a place to escape and getaway to for years to come. A1 Mountain Realty can help you purchase Homes for Sale in Ashe County NC, one of the most preserved regions of the Blue Ridge Mountains. The town of West Jefferson NC is one of the premier areas to buy Western North Carolina Mountain Property. If you are interested in Land for Sale in Ashe County, check out the Ashe County NC Real Estate listings from our website&nbsp;&nbsp; (www.a1mountainrealty.com) for NC Mountain Land for Sale.